Having an air mattress at home comes in handy. Hosting overnight guests becomes much less stressful if you know you have a bed ready to inflate for your guests and don’t have to give up your own bed or banish them to the couch. Some people even choose to sleep on air mattresses instead of traditional mattresses long-term to save money on furnishing a condo or apartment. 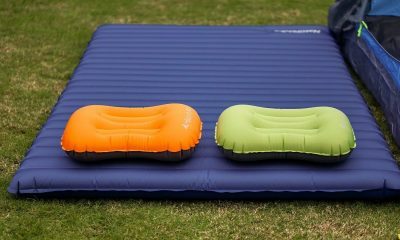 Buying an air mattress to use at home is different than shopping for an inflatable bed for camping or backpacking. People usually expect a mattress inside a house to be more comfortable than something they’d sleep on while camping in the woods. Air mattresses for home use should feel as close to a real mattress as possible. They should be soft, comfortable, quiet, and durable. Unfortunately, not all air mattresses have these qualities. Having an air mattress at home can be a lifesaver, but not if it’s a low-quality bed that squeaks like a balloon or leaks air all night long. If you’re in the market for an air mattress to use at home, check out these six top-quality inflatable beds that feel as close to the real thing as possible. Inflate this queen-sized air mattress quickly, easily, and quietly. Its patented one-click toggle allows you to inflate and deflate the bed effortlessly. The toggle connects to a powerful motor that fully inflates or deflates the mattress within 4 minutes and is twenty percent quieter than the motors of other leading inflatable mattresses. 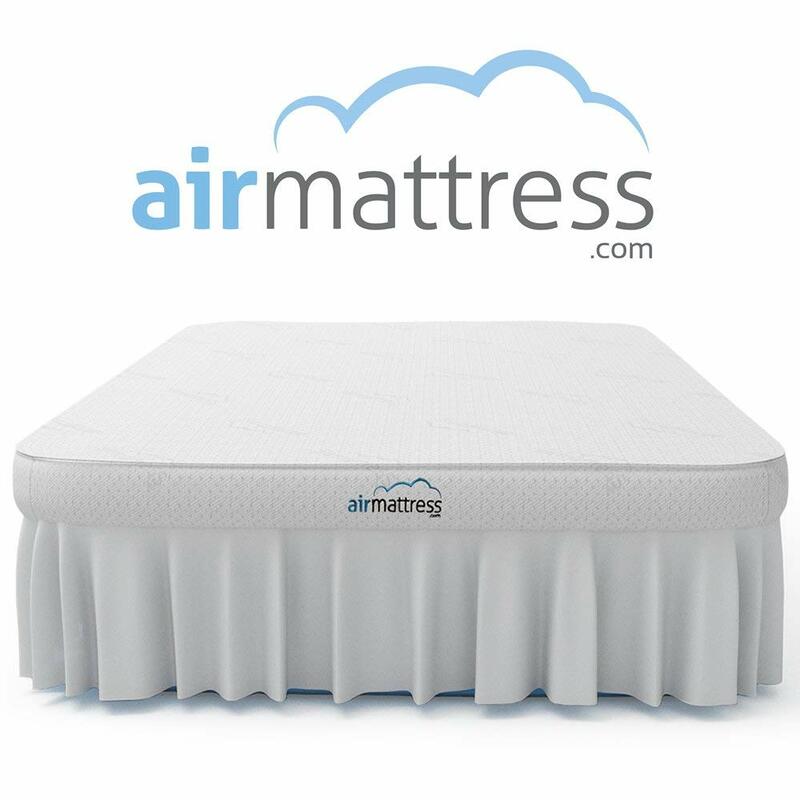 Unlike other air mattresses that don’t stay firm and flat, this mattress is built with ComfortCoil technology and includes 40 internal air coils that create a lasting firm, flat surface. A special Sure-Grip bottom prevents the mattress from sliding on any surface, so you can set it up and sleep comfortably on hard or carpeted floors. Sleeping on this mattress is comfortable and peaceful for individuals and couples alike, as it won’t move around or change shape during the night. Plus, it is a roomy queen size with a dual-chamber construction that raises it to a comfortable height that isn’t too low to the ground. Durable as well as functional, the mattress features a thick, waterproof top layer and multilayer 15-gauge puncture-resistant material. A coil-beam construction with air-filled coils and internal layering keeps this mattress firm and makes it feel more like a traditional, solid mattress than an inflatable one. It is queen-sized and elevated to the height of a standard mattress and box spring, so your guests will fit comfortably without feeling like they’re sleeping on the floor. Fully inflating the mattress takes less than 3 minutes and is effortless with a built-in plug in internal air pump. Sheets and bedding won’t slide off the sueded top layer of this mattress, and the inflatable bed’s ultra-grip bottom won’t slip around even on hard, slick surfaces. 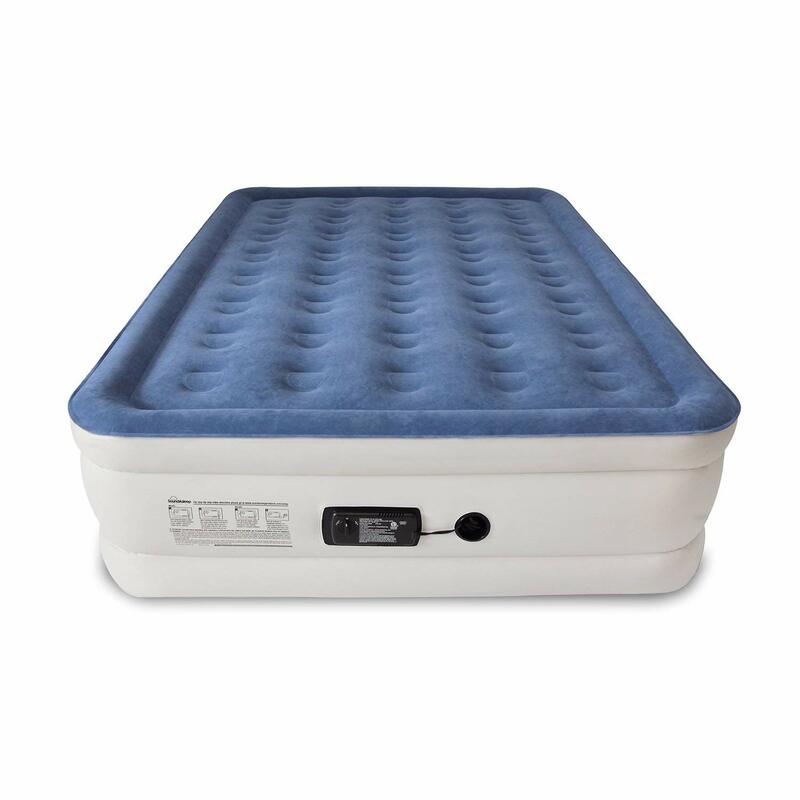 A built-in thick quilted top and flat, firm feel guarantee comfort without a mattress topper. Plus, you don’t have to worry about telling your house guests to bring a pillow, or about lugging a pillow around with you if you’re traveling with this mattress. A soft, comfortable pillow large enough to support two heads is built into the top of the mattress. 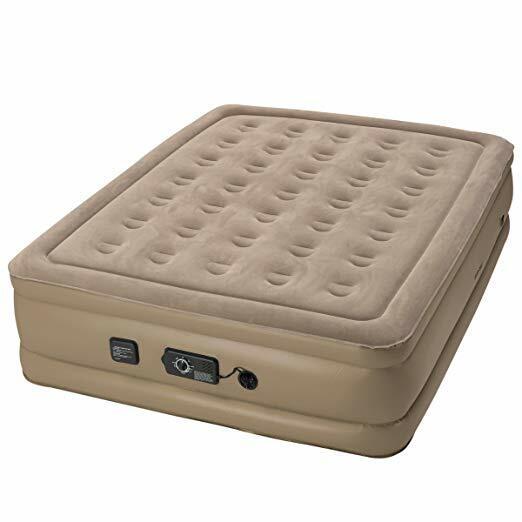 This large, queen-sized air mattress provides a stable, comfortable place to sleep for you or your house guests. 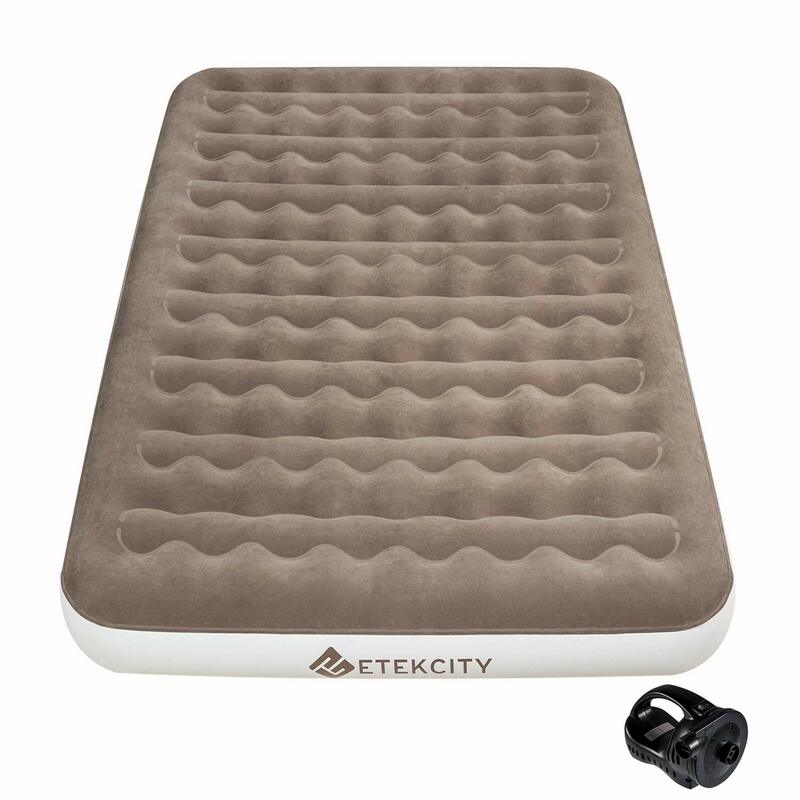 Its multi-layer interior creates a firm, supportive surface that prevents this air mattress from feeling like it’s full of air. Its special non-toxic, soft, flocked surface ensures a comfortable sleeping experience and prevents any bacterial growth and allergy issues. You or your guests can use the included cordless multi-nozzle air pump to easily adjust the inflation of this air mattress until it reaches your ideal level of firmness or flexibility. Durability is a priority for this air mattress. Its seams are welded together to ward off air leaks even after countless all-night uses. Its anti-skid base also keeps it from sliding around on any surface and prevents friction damage. This roomy, full-sized air mattress comfortably fits two people at a time. Its ComfortCoil technology with 40 internal air coils ensures a stable, peaceful sleeping experience whether the mattress is shared or slept on alone. 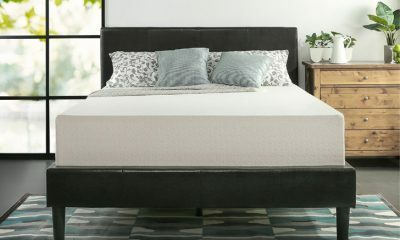 Straightforward electric controls allow you to choose between 7 different settings to adjust the firmness of the mattress to meet your preferences. No matter which firmness setting you choose, full inflation takes less than 4 minutes every time. Built to last, this mattress is made from multiple strong layers of leakproof and puncture-proof material. A flocked waterproof top and sure-grip bottom further guarantee its durability. Your guests won’t be able to tell the difference between this king-sized inflatable bed and a solid mattress when it’s set up in your guest room. 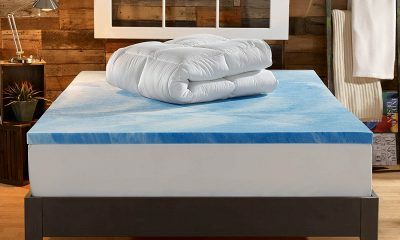 Its elevated height laminated vinyl material makes it look and feel like a traditional mattress. Plus, its included bed skirt and fitted top sheet add to the convincing illusion that this inflatable bed is actually completely solid. Say goodbye to back pain, morning soreness, and any other post-sleeping discomfort. 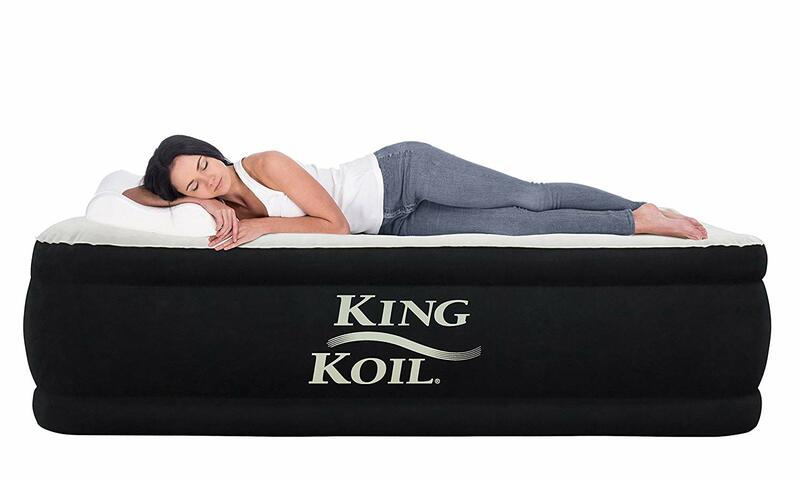 This inflatable mattress is firmer than most air mattresses and even many solid mattresses. It offers an ultra-firm, stable surface for one or two people to enjoy comfortably all night long. The most frustrating thing about sleeping on a low-quality air mattress is waking up closer to the ground than you were when you fell asleep. Deflation is an impossibility with this queen-sized, elevated air mattress. It includes a special second pump that constantly monitors and maintains air pressure to keep the bed fully inflated while you sleep. You won’t even hear the whisper-quiet motor as it fully inflates or deflates your bed in less than 4 minutes. Before inflating, choose between three comfort levels: plush, medium, and firm. When the mattress finishes inflating to your desired level of firmness, its motor shuts off automatically to protect against overfilling and leakage. 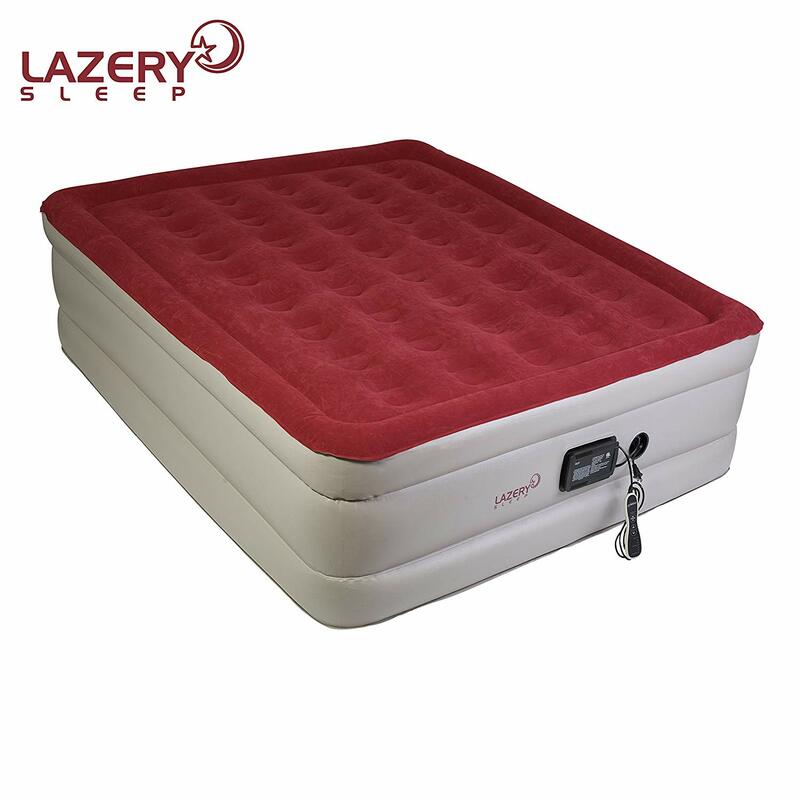 35 internal coils ensure a flat and firm sleeping surface that feels just like a solid mattress. Moving into a new apartment? Expecting house guests? 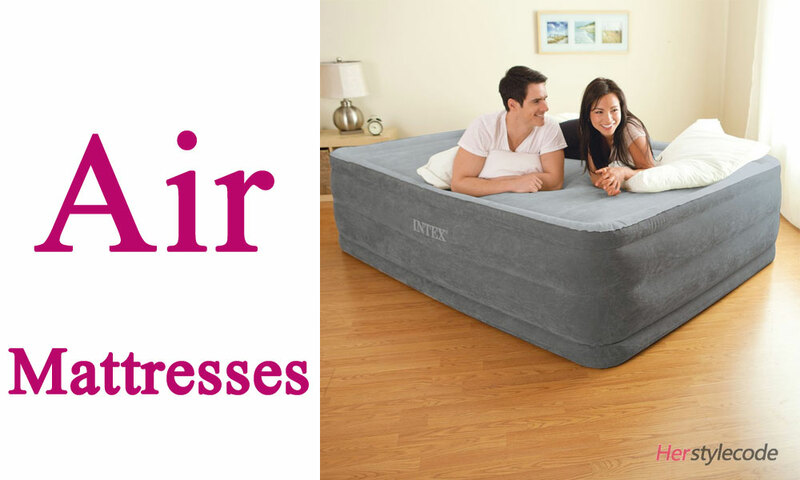 Anyone can enjoy a superior sleeping experience on these to-quality at-home air mattresses. Excelling in comfort, stability, and durability, these air mattresses make sleeping on an inflatable bed feels more like a luxury than a temporary inconvenience.